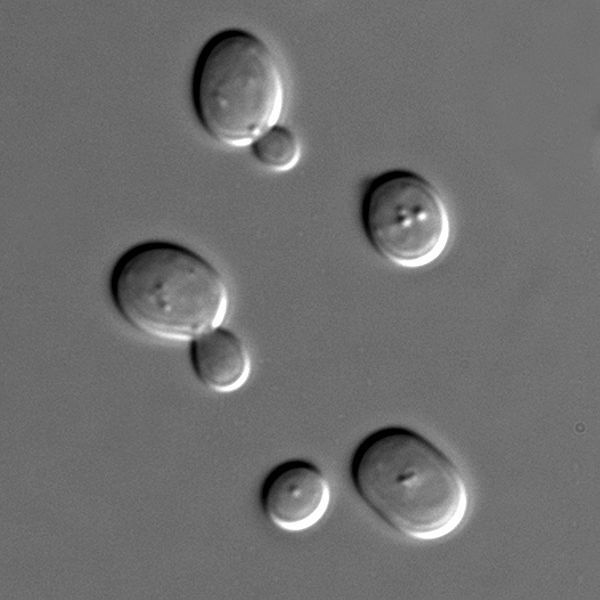 Saccharomyces cerevisiae (or brewer's yeast, baker's yeast) is a model organism studied in biology laboratories. Saccharomyces cerevisiae is a unicellular yeast, a eukaryotic organism belonging to the fungal kingdom and the Saccharomycetes family. in an aerobic environment where it ferments, i.e.it converts sugar into alcohol. It is a widely used yeast in cooking (to raise dough) and to produce alcohol. Saccharomyces cerevisiae is a model organism in that it is the simplest eukaryotic organism. Researchers can therefore try to understand the processes involved in biological mechanisms before testing in human beings. It has the advantage of reproducing rapidly and can also be transformed in order to express new genes and test substances, etc.